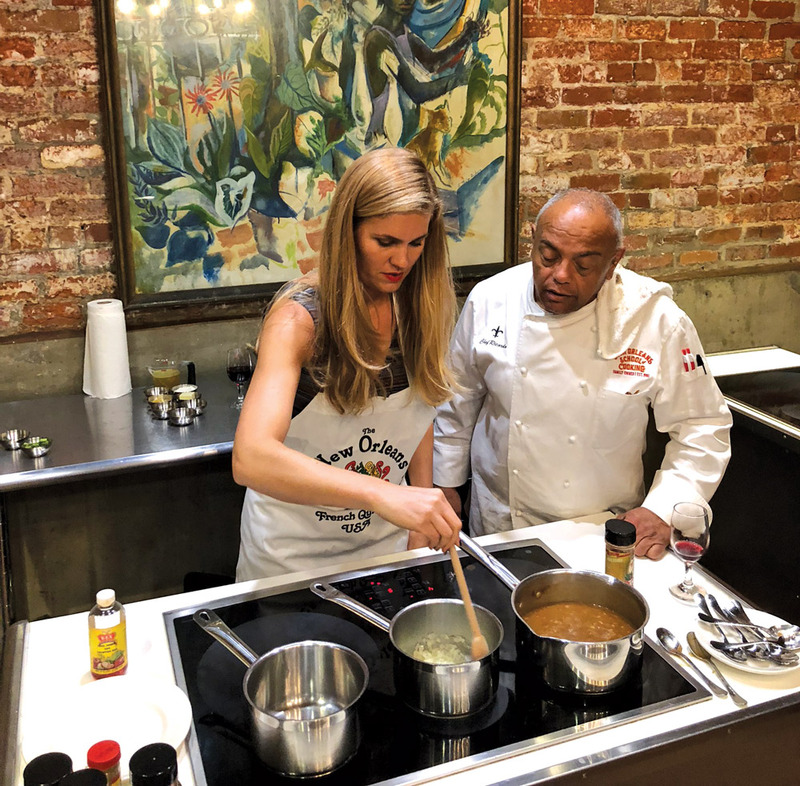 Writer Allison Entrekin makes a roux under the watchful eye of New Orleans School of Cooking instructor Ricardo Fredericks. Have you ever tried to make a roux? It sounds easy. Just combine equal parts lard and flour over heat. But it is not easy. I’ve been stirring twenty minutes, and it’s still not the rich, reddish-brown color it’s supposed to be. It’s also too thick, so I have to add oil. I keep stirring, and the mixture begins to turn several shades of tan, which means I’m moving too slowly. 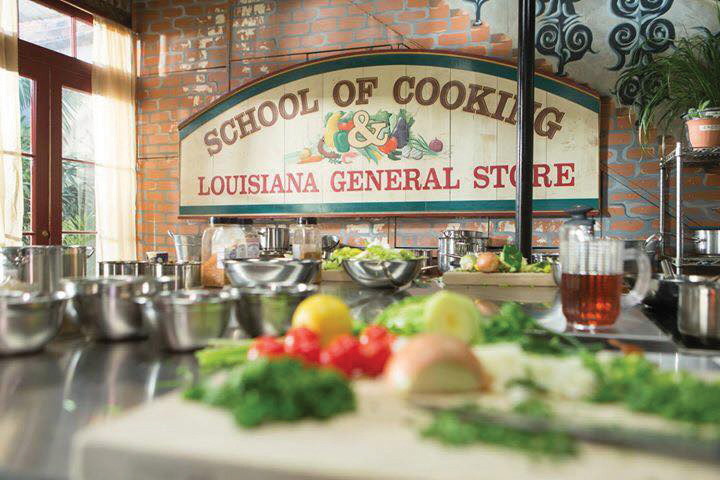 “Don’t stir,” says Ricardo Fredericks, my instructor at the New Orleans School of Cooking. “Push and pull.” And so I dredge the roux back and forth, hoping I can get this right and learn to make my husband’s favorite dish, gumbo. It is fun being in this nineteenth-century French Quarter warehouse, standing in front of a professional-grade stove and making a roux. It’s also intimidating. Roux is the building block for my recipe, the thing the separates the real Louisiana cooks from the pretenders. (The school’s adjoining store sells a book entitled Who’s Your Mama, Are You Catholic, and Can You Make a Roux?) I am admittedly a pretender, but I’d at least like to pretend in a way that results in something edible. Gumbo prepared at the New Orleans School of Cooking. It’s time to add “the trinity”—onions, celery, and green peppers—to my gumbo. Next, garlic, “the pope of flavor.” I stir them into my roux; their fragrances are as divine as their nicknames. By the time I throw in chicken and Andouille sausage, I’m starting to feel pretty good about what’s inside my little pot. I sprinkle dried sassafras leaves, called file (pronounced “fee-lay”), over the top, add some crab boil spice mix, and allow myself a taste. Damn. My husband is lucky. The rest of the evening, I cook up a feast of fish meuniere, maque choux, and pecan pralines. The fish is golden brown and rich, thanks to the “monter au beurre” (mount with butter) technique Fredericks teaches me as I finish the dish. The maque choux, a popular corn-based side dish, delivers a spicy jolt, and the warm pralines melt on my tongue. By the time I return to my room at the Pontchartrain Hotel, I am both very proud and very, very full. By the next day, though, I’m hungry for more. I show up for Destination Kitchen‘s food tour of the French Quarter, which provides culinary inspiration to home cooks like me. 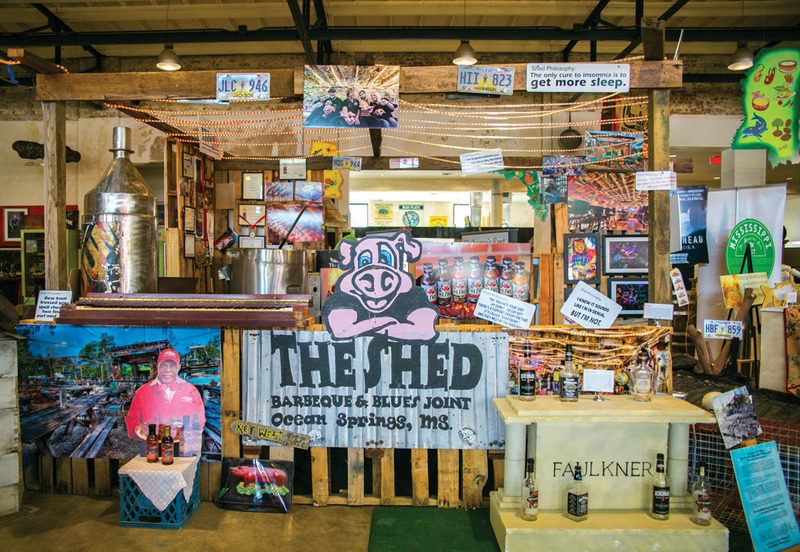 Our guide, Lisa Smyth, has us sample everything from boudin balls at Kingfish to Creole beef brisket at Tujague’s to muffalettas at Alberto’s in the French Market. 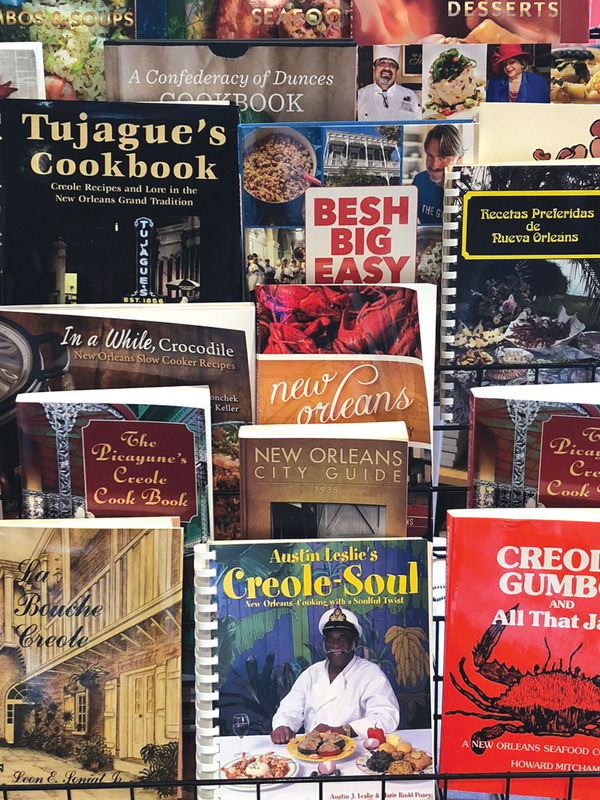 She tells us the ingredients in each dish, introduces us to the chefs, and reminds us that New Orleans is the only city in the country with its own cuisine. “When you learn to cook like we do, you share in our identity,” she says. After the tour, I spend the afternoon browsing cookbooks at Kitchen Witch, ogling culinary antiques at Lucullus (where I fall in love with a rare nineteenth-century absinthe spoon holder), and checking out the massive Southern Food and Beverage Museum, complete with its own demo kitchen. For dinner, I head to Brigtsen’s in Uptown, where Chef Frank Brigtsen has cooked classic Creole dishes for the last thirty-one years. Brigtsen trained under legendary New Orleans chef Paul Prudhomme, and he’s known as a torchbearer for the city’s traditional recipes. 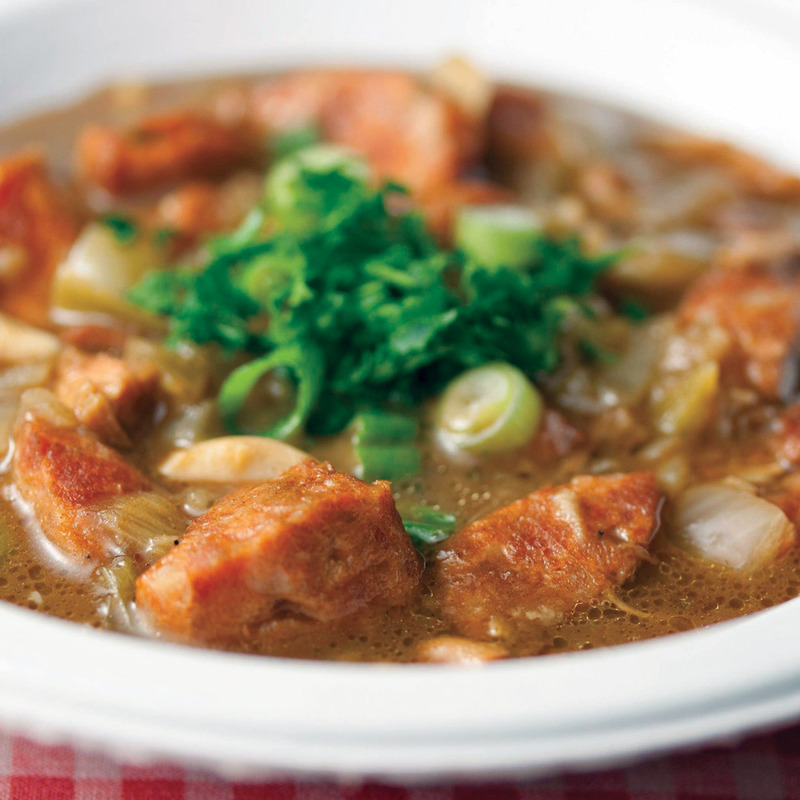 I order a bowl of his famous gumbo made with rabbit, Andouille, and okra. When it arrives, it’s the perfect shade of reddish brown with a dollop of rice floating on top. I take a bite and let out a sigh. “You know I made the roux for that in three minutes?” Brigtsen says, walking up to my table. I let go of my spoon. Well, I guess there’s more than one way to make a roux. My method may not be the most expedient—but my husband’s still lucky.